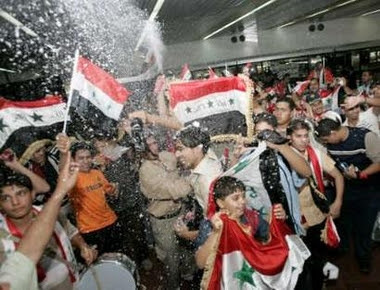 IRAQI SOCCER PLAYERS SOB at Homecoming Celebrations! 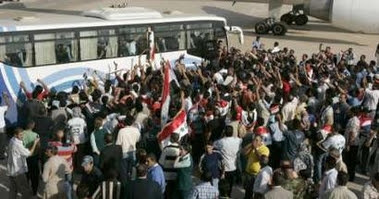 The Iraqi Soccer Team sobbed as they returned home as heroes! 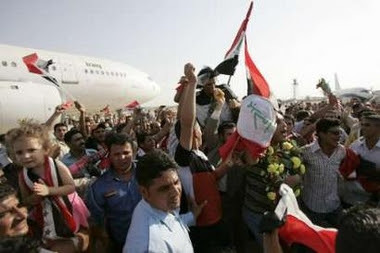 The Iraqi soccer players sobbed tears of joy as they returned to their country with the first place trophy from the Asian Games. “There is no happier moment,” goalkeeper Noor Sabri told Iraqiya state television in the airport arrival lounge, choking back tears as other players behind him sobbed. “I don’t know what to say. All I can say is congratulations to the mothers of the martyrs,” he said, paying tribute to victims of his country’s sectarian strife. 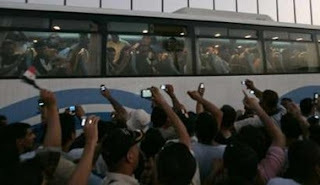 Hundreds of Iraqis managed to negotiate a series of security checkpoints in blistering summer heat to reach the airport in the hope of catching a glimpse of their heroes. “People have been dancing and chanting and singing all day. We haven’t gotten tired,” a government employee who was at the airport told Reuters. NOTE: A couple of captions to the photos were cleaned of political commentary and the AP’s sad political commentary on the event was not included in this posting.